BEIJING - Shares in Tokyo led world markets higher on Tuesday on expectations, later confirmed, that the Japanese government would respond to a recession by postponing a sales tax hike. Germany's DAX rose 1.2 percent to 9,419.11 and France's CAC-40 added 0.7 percent to 4,257.40. Britain's FTSE 100 gained 0.4 percent to 6,699.67. Wall Street was set to open flat, with futures for both the Dow Jones industrial average and Standard & Poor's 500 unchanged. Japan's Prime Minister Shinzo Abe told leaders of his party he would postpone a sales tax hike planned for next year until 2017 and hold elections in December, according to public broadcaster NHK. That confirmed widely held expectations that the economy's contraction in the latest quarter, despite the "Abenomics" strategy of loose monetary policy and higher spending, would prompt a delay and new elections. Finance Minister Akira Amari suggested Monday there was a high chance of a stimulus package. Japan's economy, the world's third largest, has now contracted for two straight quarters, meeting the definition of a recession. "The decision not to hike (the Japanese sales tax) means the economy should be stronger over the next couple of years than would otherwise be the case," said Mark Williams of Capital Economics in a report. "That in turn should help the Bank of Japan by increasing price pressures. But we still expect inflation to fall short of the 2 percent target, so more monetary easing is still likely to be required." Germany's ZEW measure of investor sentiment showed an improvement in November after 10 months of declines. The indicator rose 15.1 points back into positive territory, to 11.5 points. It remains below historical averages, however, as investors worry about a broader slowdown in Europe. Tokyo's Nikkei 225 index rose 2.2 percent to close at 17,344.06 before broadcaster NHK reported Abe will postpone a planned sales tax hike and call elections. Seoul's Kospi added 1.2 percent to 1,966.46. The Shanghai Composite Index shed 0.6 percent to 2,456.37 and Hong Kong's Hang Seng declined by 1.1 percent to 23,529.17. Singapore and Indonesia were up, while Sydney declined. Benchmark U.S. crude was up 4 cents to $75.68 a barrel in electronic trading on the New York Mercantile Exchange. The contract shed 18 cents on Monday to close at $75.64. 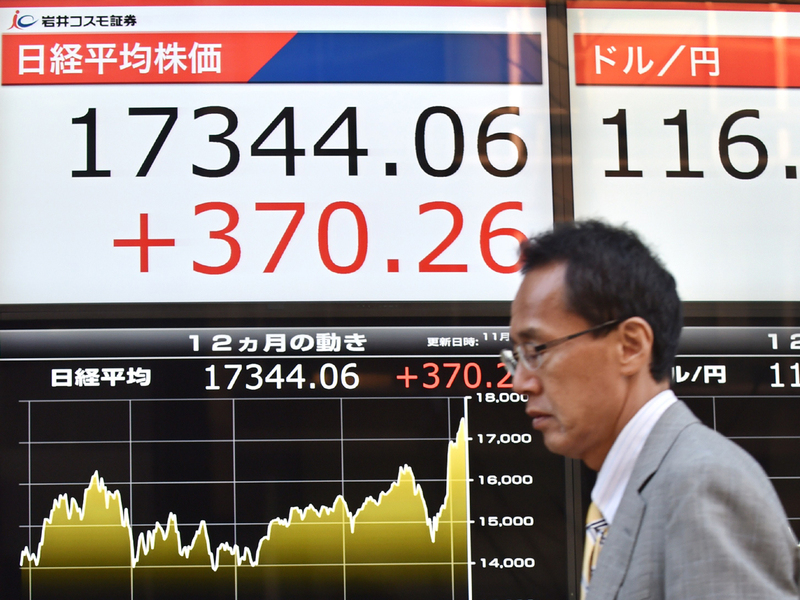 The dollar dipped to 116.66 yen from Monday's 116.71 yen. The euro rose to $1.2510 from $1.2462.